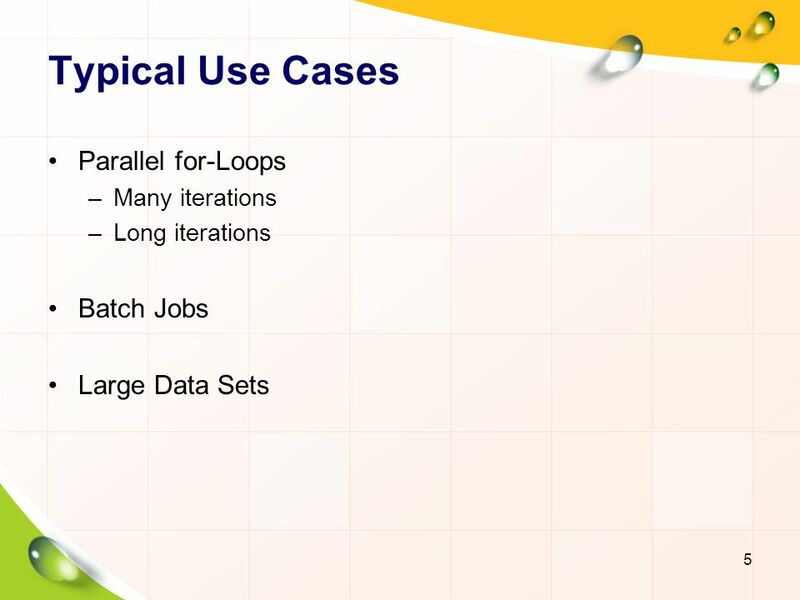 Many iterations Long iterations Batch Jobs Large Data Sets Batch Jobs When working interactively in a MATLAB session, you can offload work to a MATLAB worker session to run as a batch job. 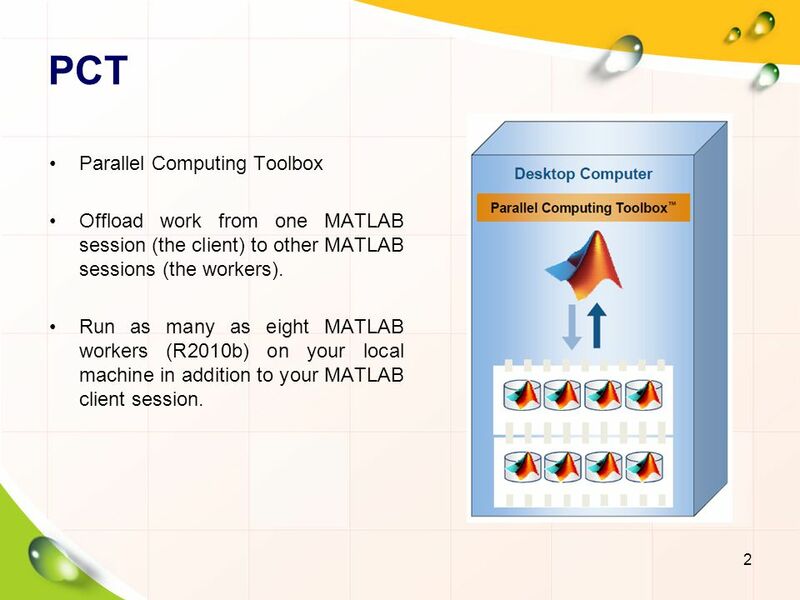 The command to perform this job is asynchronous, which means that your client MATLAB session is not blocked, and you can continue your own interactive session while the MATLAB worker is busy evaluating your code. 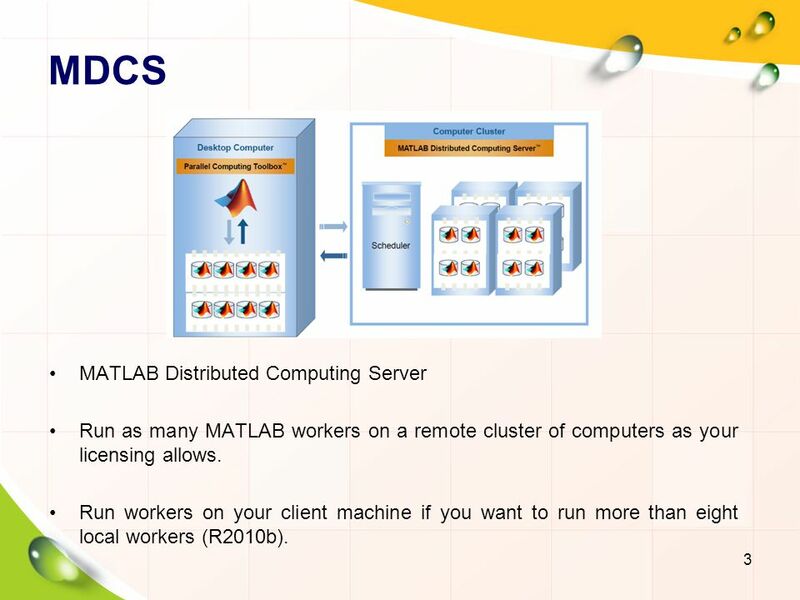 The MATLAB worker can run either on the same machine as the client, or if using MATLAB Distributed Computing Server, on a remote cluster machine. 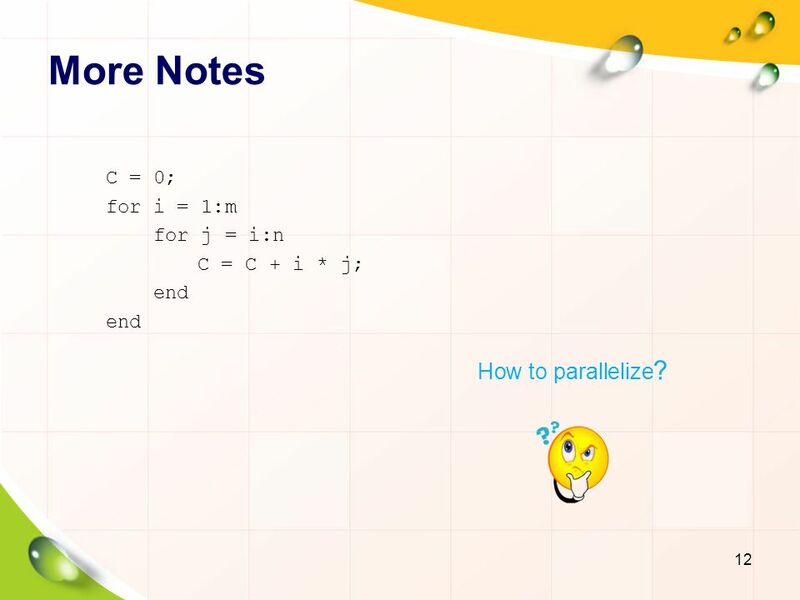 6 Parfor Parallel for-loop Has the same basic concept with “for”. 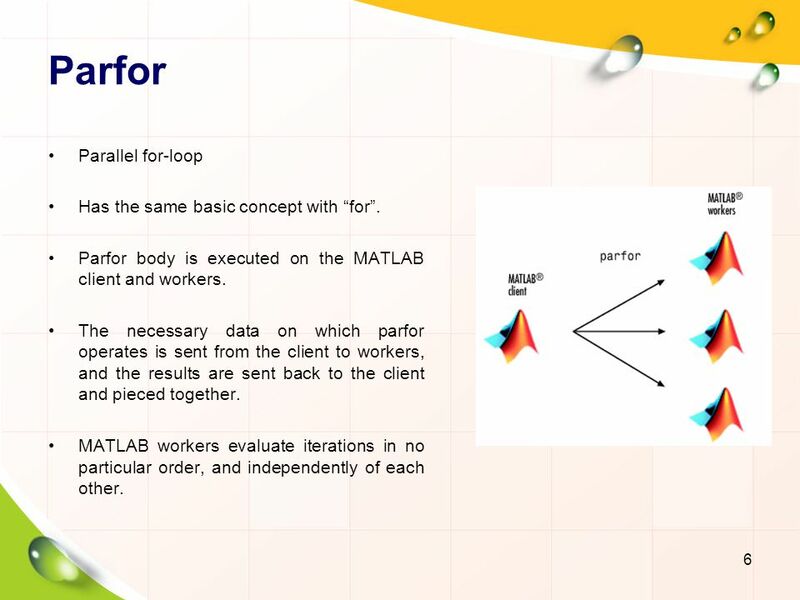 Parfor body is executed on the MATLAB client and workers. The necessary data on which parfor operates is sent from the client to workers, and the results are sent back to the client and pieced together. 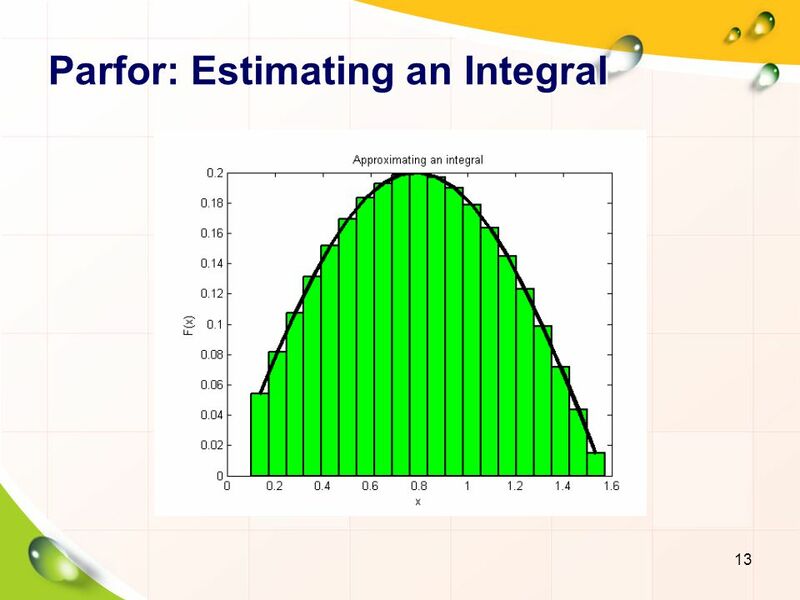 MATLAB workers evaluate iterations in no particular order, and independently of each other. 9 When to Use Parfor? Each loop must be independent of other loops. 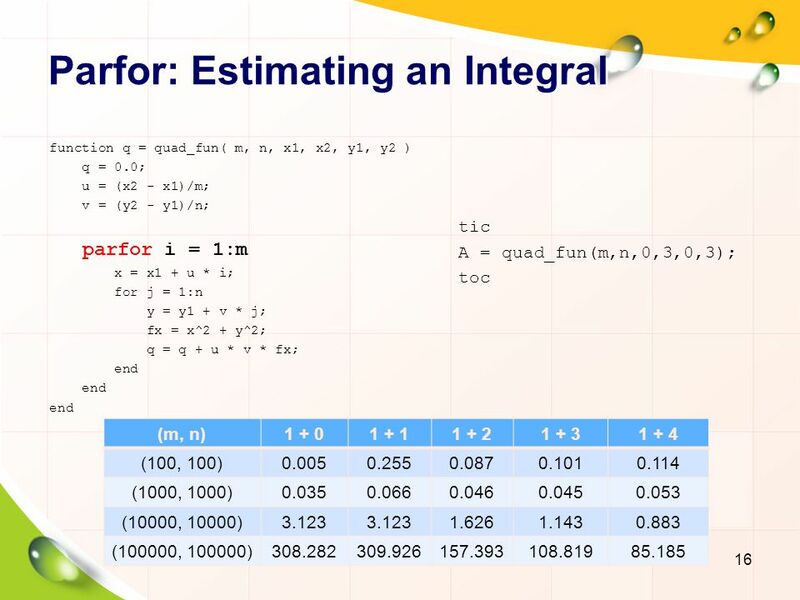 Lots of iterations of simple calculations. or Long iterations. 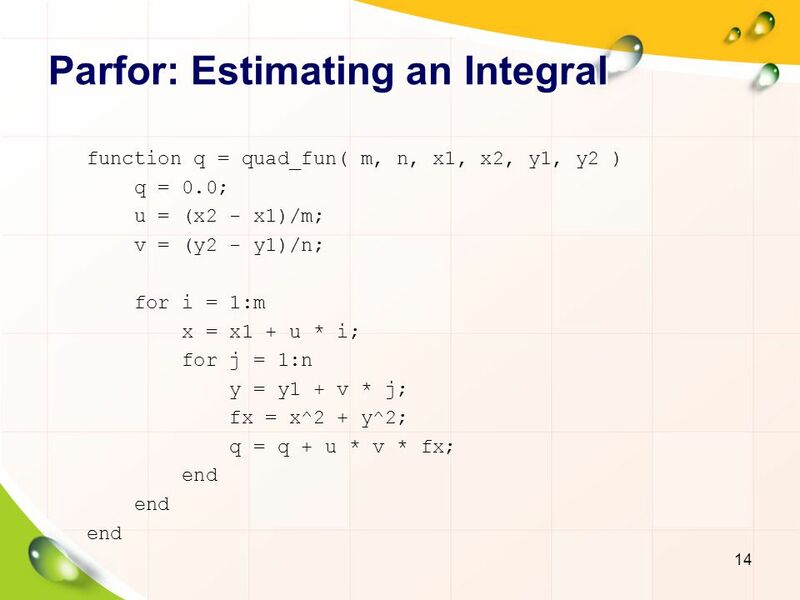 Small number of simple calculations. 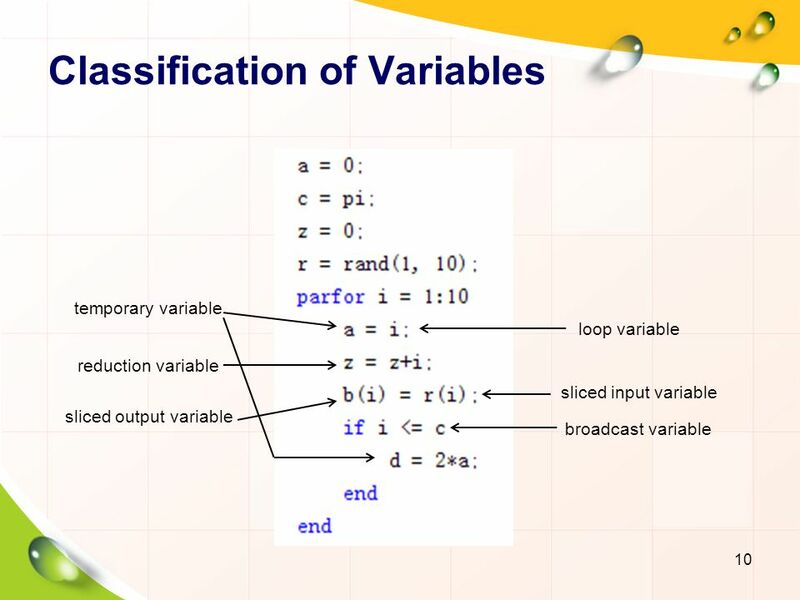 broadcast variable sliced input variable loop variable reduction variable sliced output variable temporary variable Temporary variable: parfor结束后数据销毁 Loop variable: parfor结束后值为0； Sliced variable: 可对其进行并行操作。 Reduction variable: In a parfor-loop, the value of z is never transmitted from client to workers or from worker to worker. Rather, additions of i are done in each worker, with i ranging over the subset of 1:n being performed on that worker. 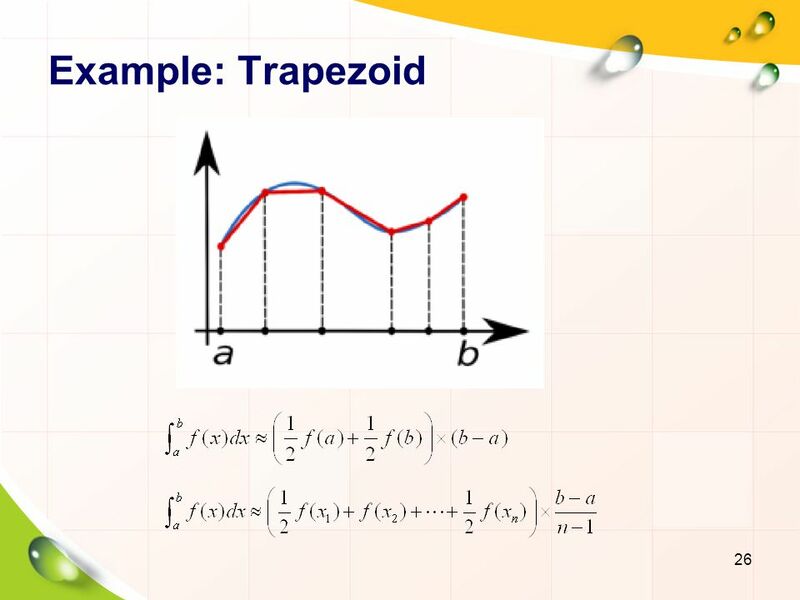 The results are then transmitted back to the client, which adds the workers' partial sums into z. Thus, workers do some of the additions, and the client does the rest. Computation complexity: O(m*n) Each iteration is independent of other iterations. 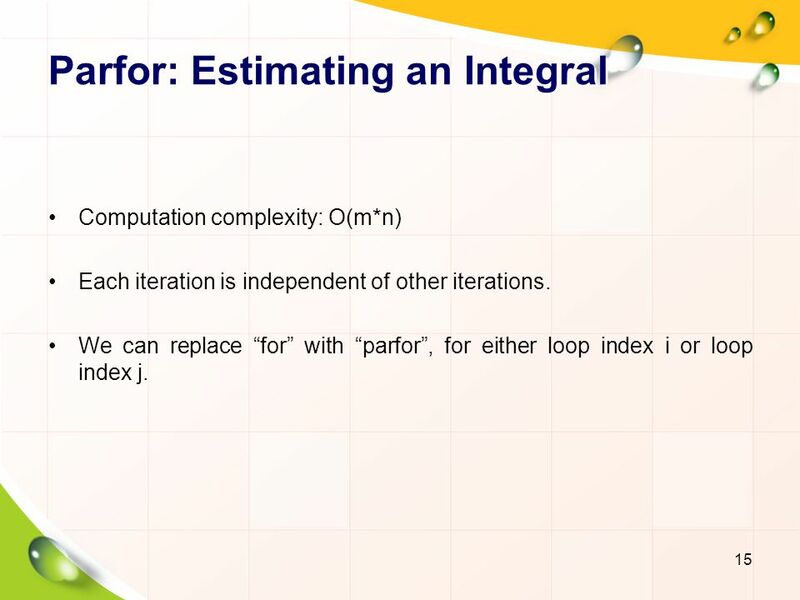 We can replace “for” with “parfor”, for either loop index i or loop index j. 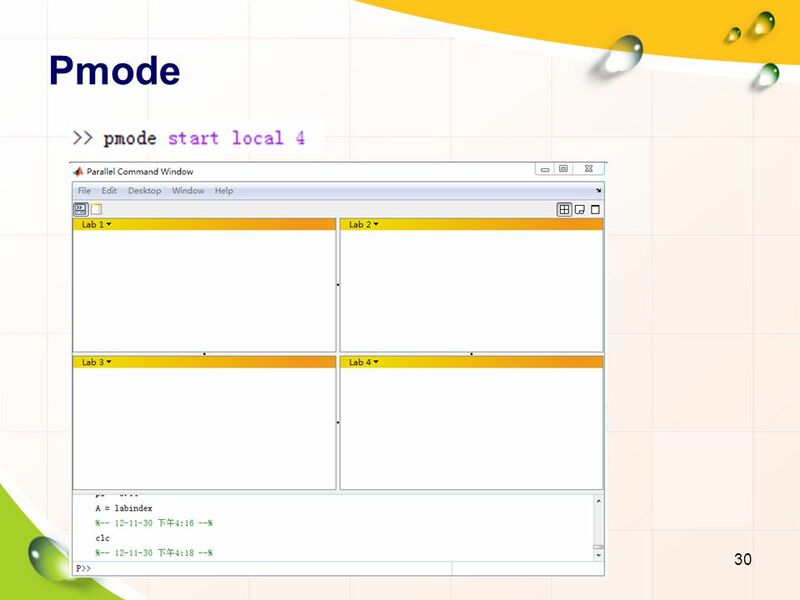 18 SPMD SPMD: Single Program Multiple Data. 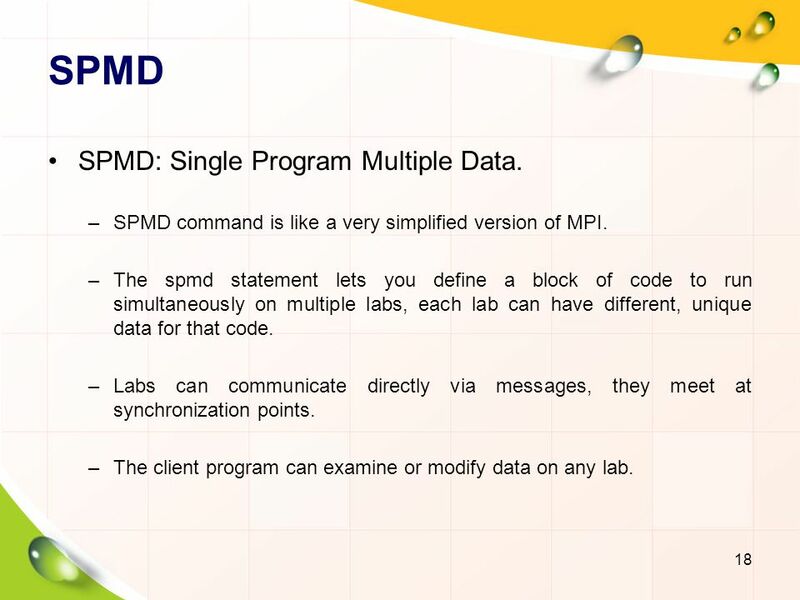 SPMD command is like a very simplified version of MPI. 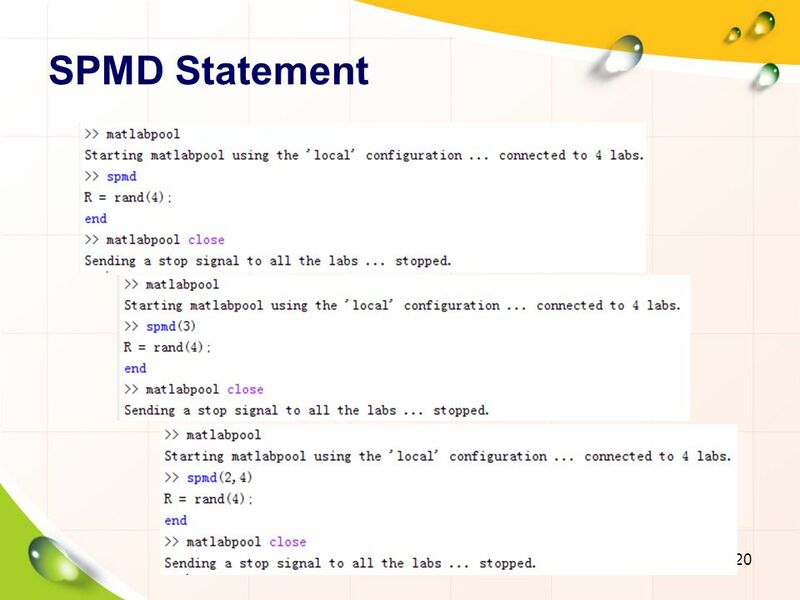 The spmd statement lets you define a block of code to run simultaneously on multiple labs, each lab can have different, unique data for that code. Labs can communicate directly via messages, they meet at synchronization points. 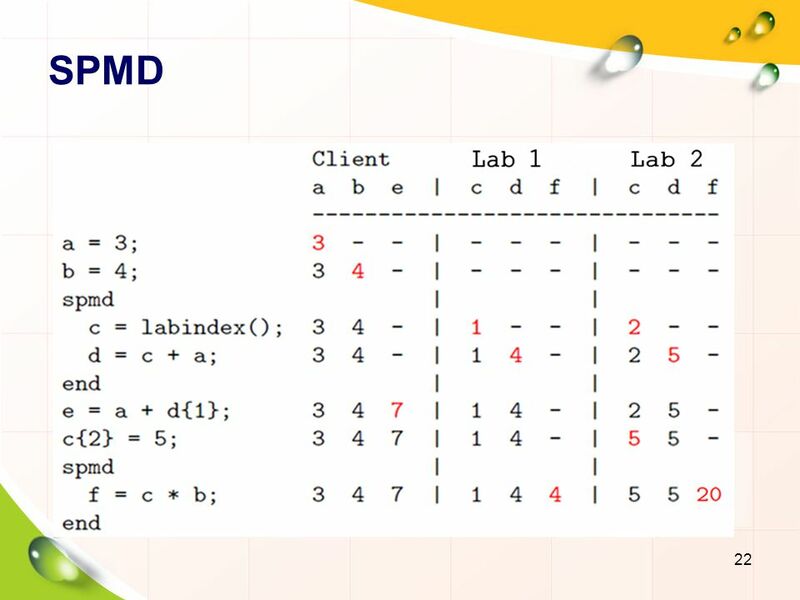 The client program can examine or modify data on any lab. 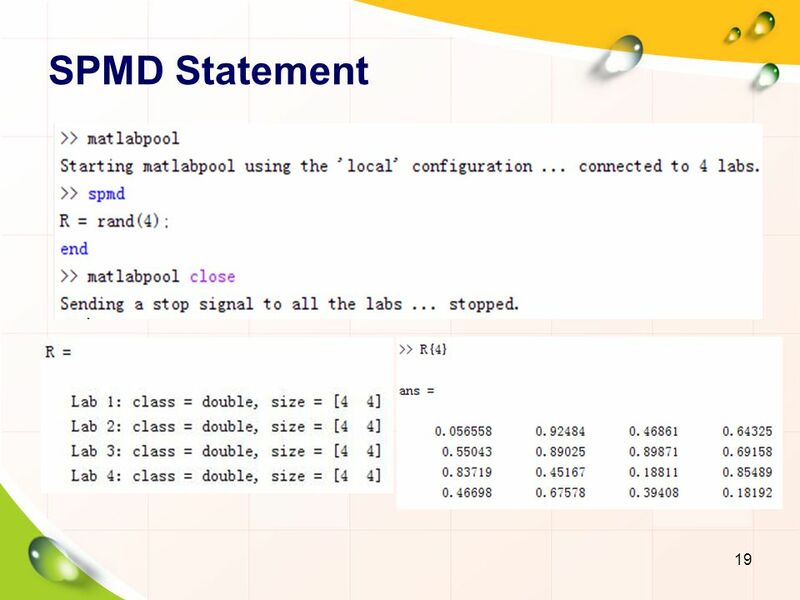 21 SPMD MATLAB sets up the requested number of labs, each with a copy of the program. 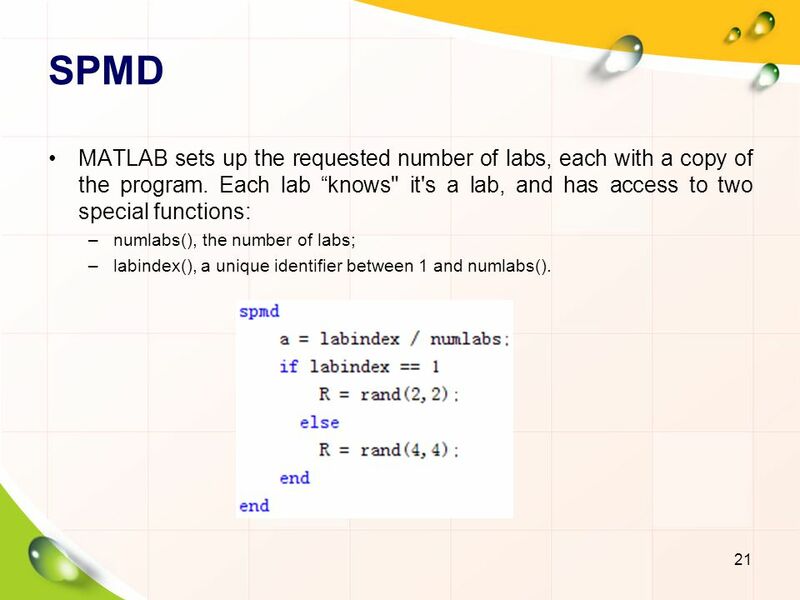 Each lab “knows" it's a lab, and has access to two special functions: numlabs(), the number of labs; labindex(), a unique identifier between 1 and numlabs(). 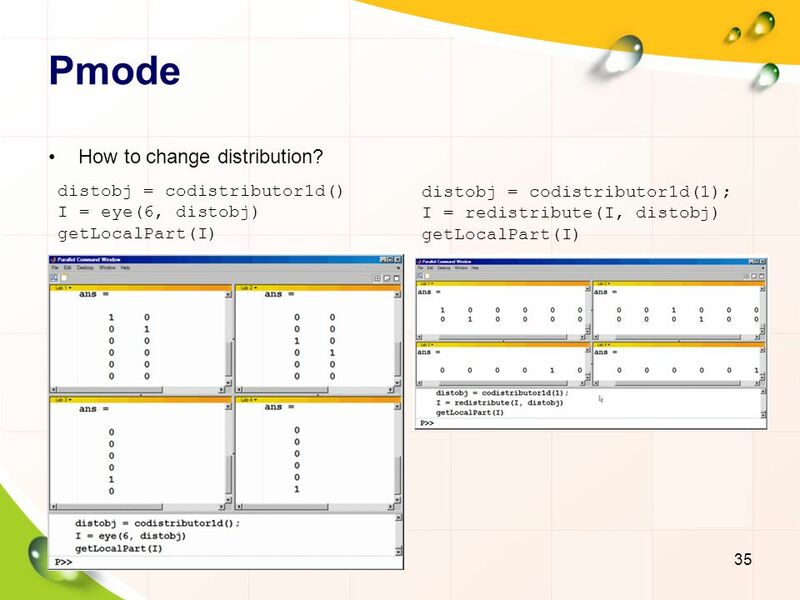 You can create a codistributed array by executing on the labs themselves, either inside an spmd statement, in pmode, or inside a parallel job. 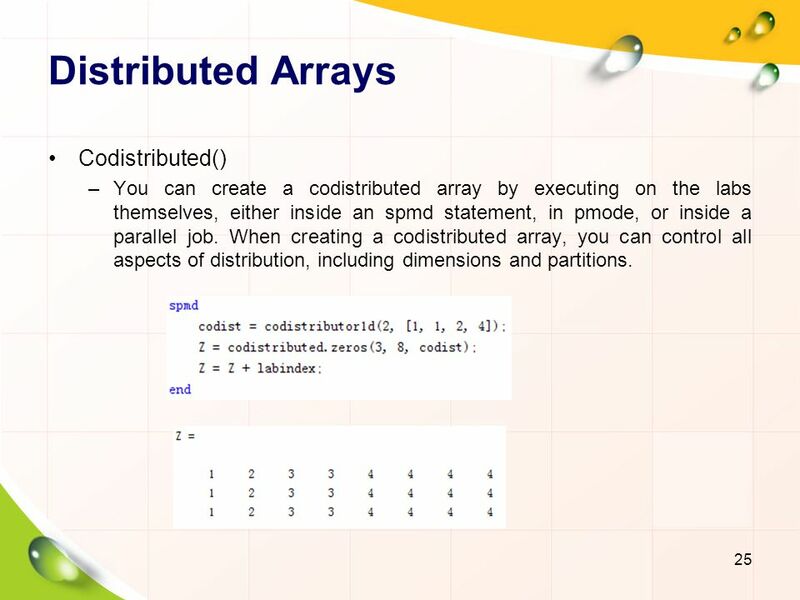 When creating a codistributed array, you can control all aspects of distribution, including dimensions and partitions. 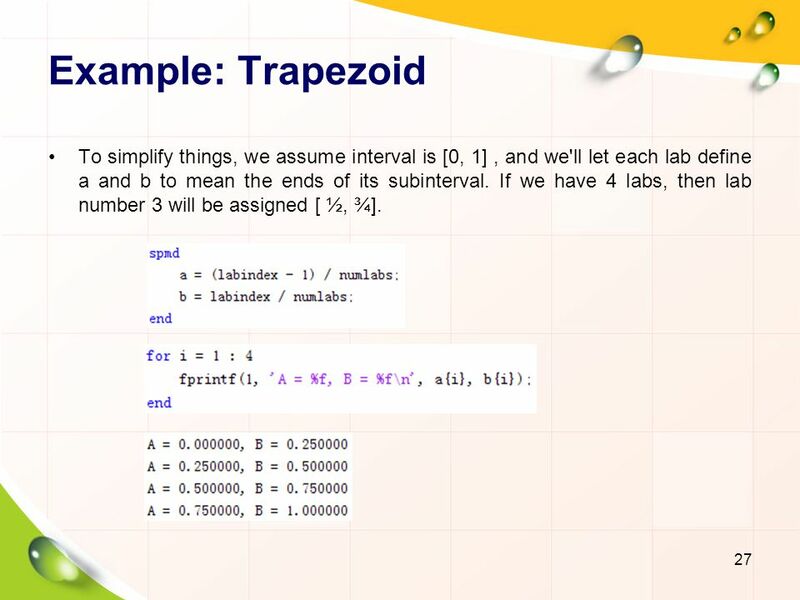 27 Example: Trapezoid To simplify things, we assume interval is [0, 1] , and we'll let each lab define a and b to mean the ends of its subinterval. If we have 4 labs, then lab number 3 will be assigned [ ½, ¾]. 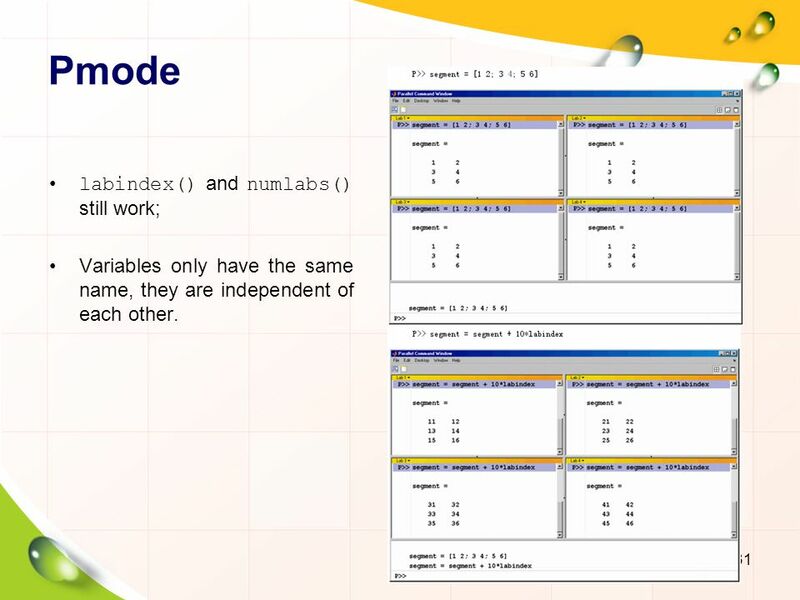 Variables only have the same name, they are independent of each other. 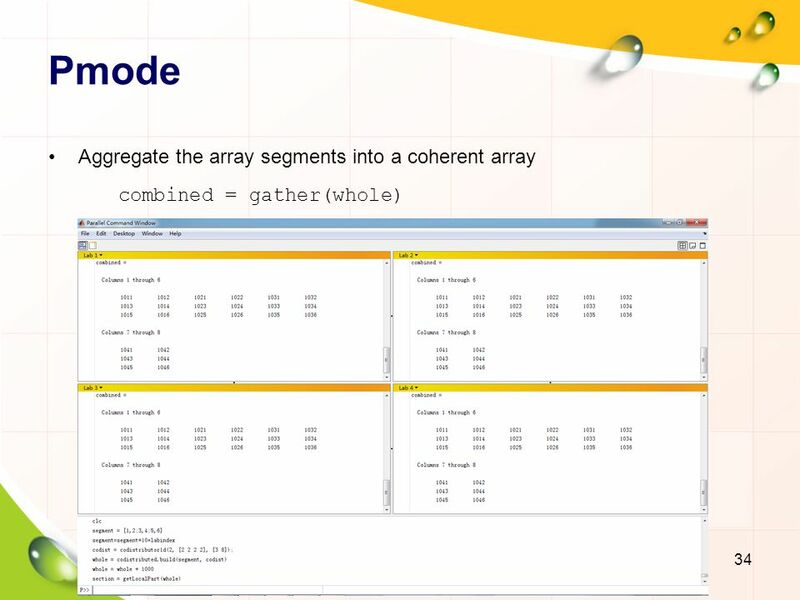 32 Pmode Aggregate the array segments into a coherent array. 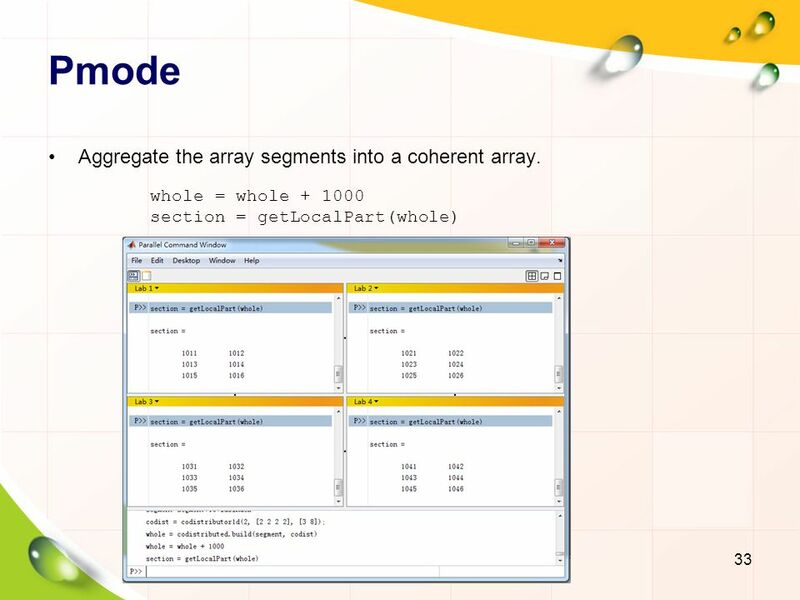 33 Pmode Aggregate the array segments into a coherent array. 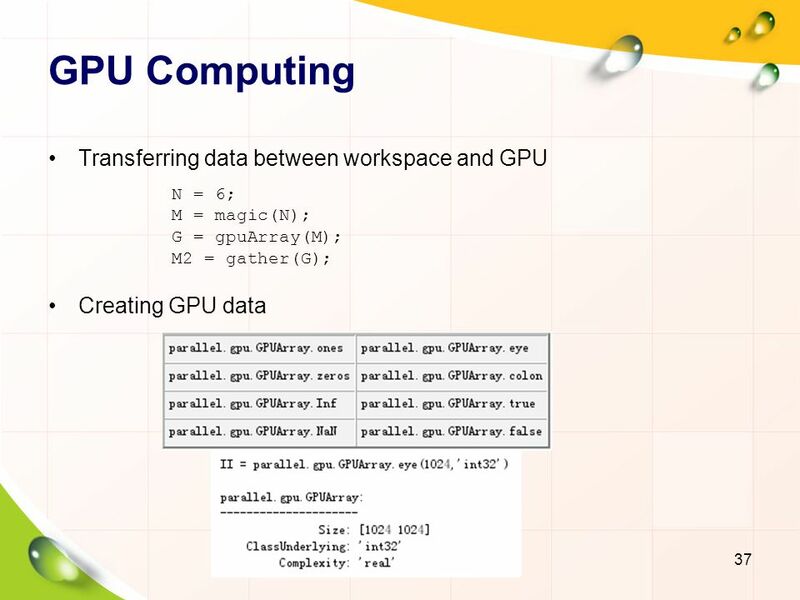 GPU Computing Executing code on the GPU You can transfer or create data on the GPU, and use the resulting GPUArray as input to enhanced built-in functions that support them. 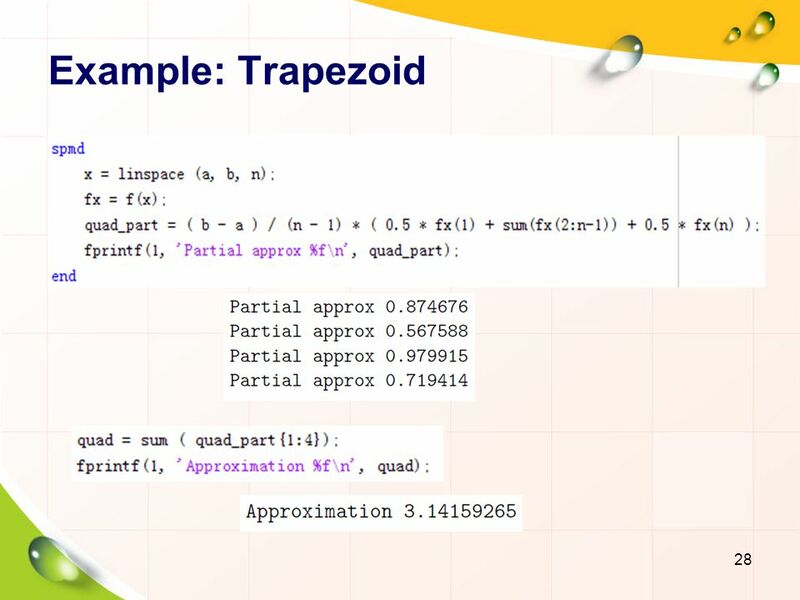 You can run your own MATLAB function file on a GPU. 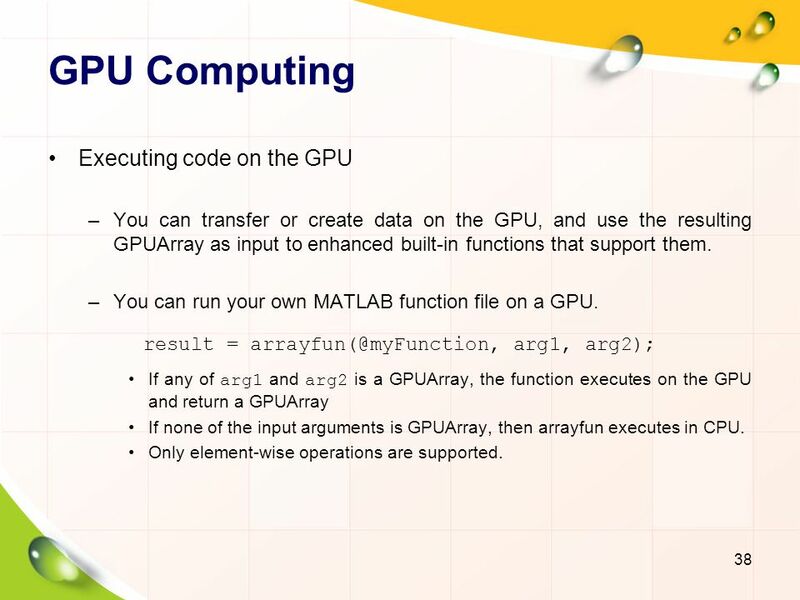 If any of arg1 and arg2 is a GPUArray, the function executes on the GPU and return a GPUArray If none of the input arguments is GPUArray, then arrayfun executes in CPU. 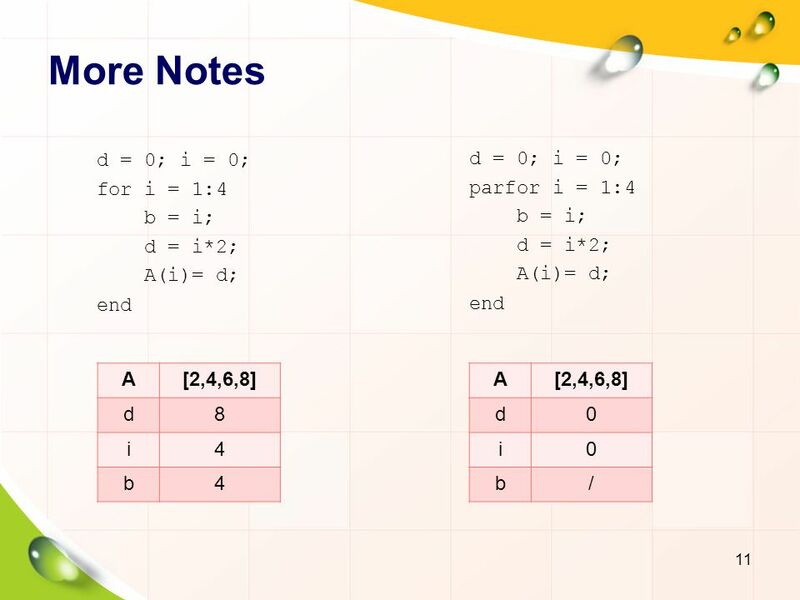 Only element-wise operations are supported. 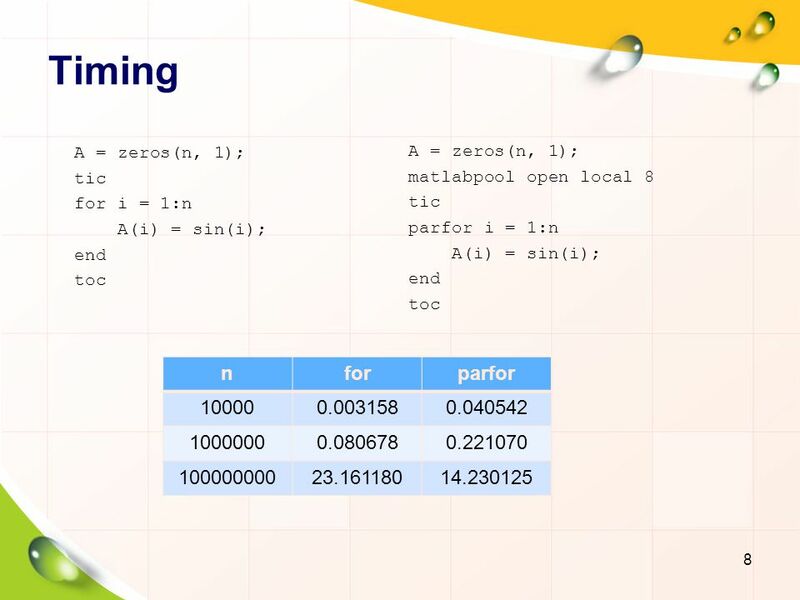 result = arg1, arg2); Arrayfun: apply function to each element of array, not specified for GPU. 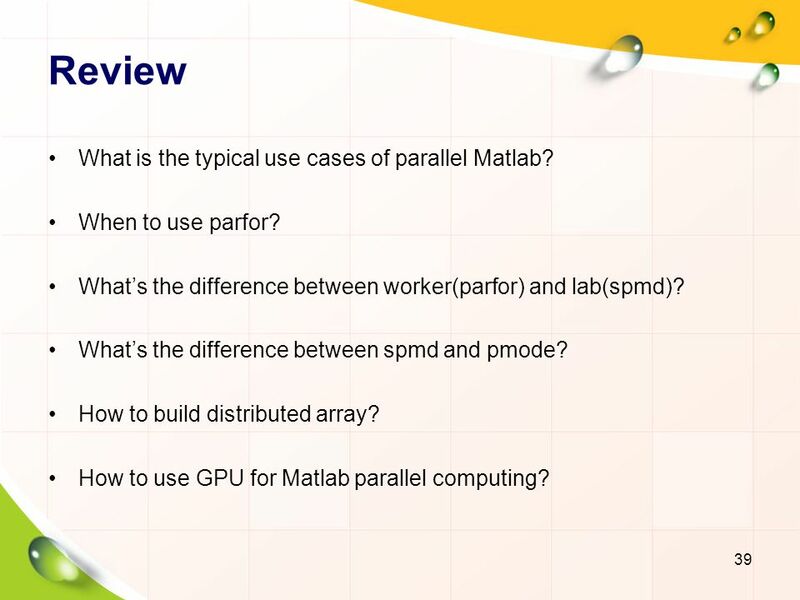 39 Review What is the typical use cases of parallel Matlab? 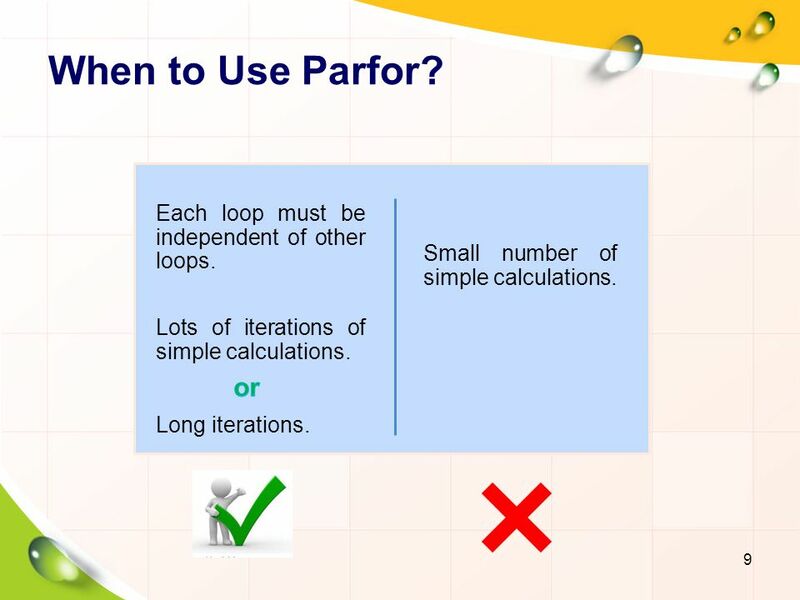 When to use parfor? 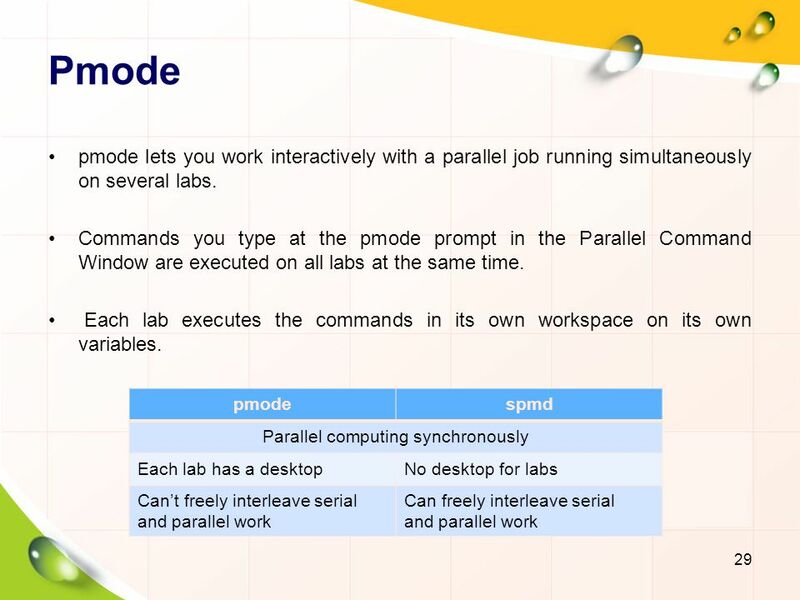 What’s the difference between worker(parfor) and lab(spmd)? What’s the difference between spmd and pmode? 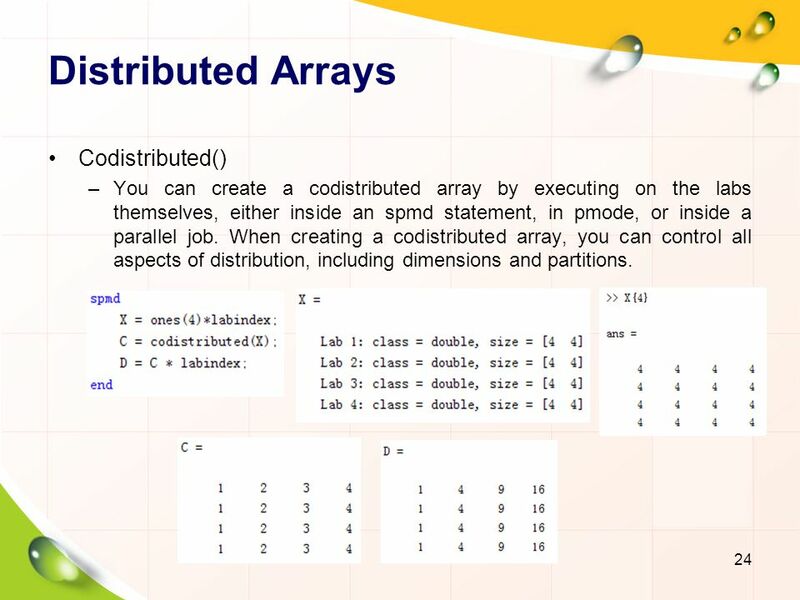 How to build distributed array? How to use GPU for Matlab parallel computing? 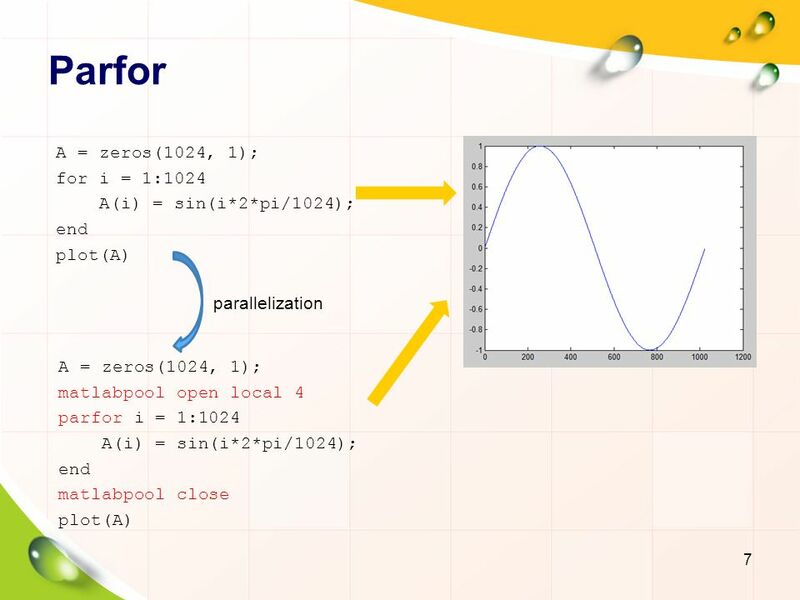 Download ppt "Parallel Computing in Matlab"
MATLAB Parallel Computing Toolbox A.Hosseini Course : Professional Architecture. 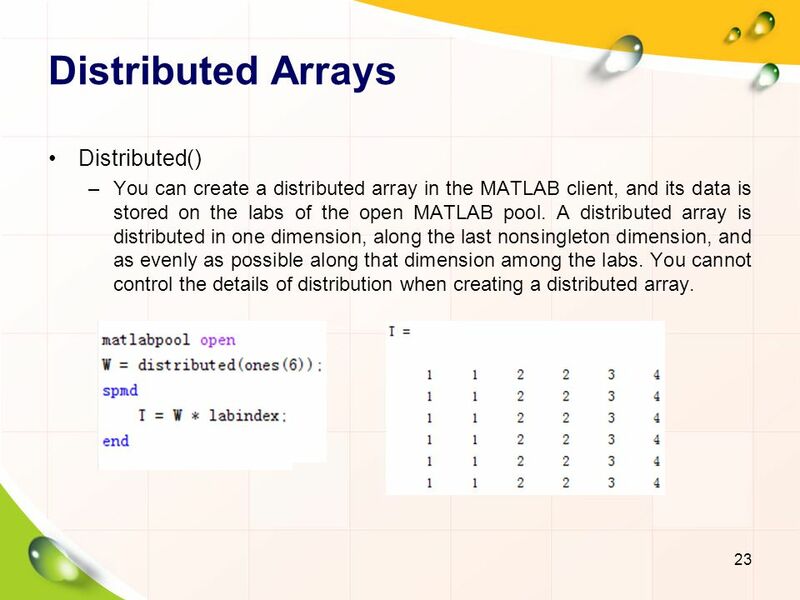 Outline Speeding up Matlab Computations Symmetric Multi-Processing with Matlab Accelerating Matlab computations with GPUs Running Matlab in distributed. Grid Resource Allocation Management (GRAM) GRAM provides the user to access the grid in order to run, terminate and monitor jobs remotely. The job request. 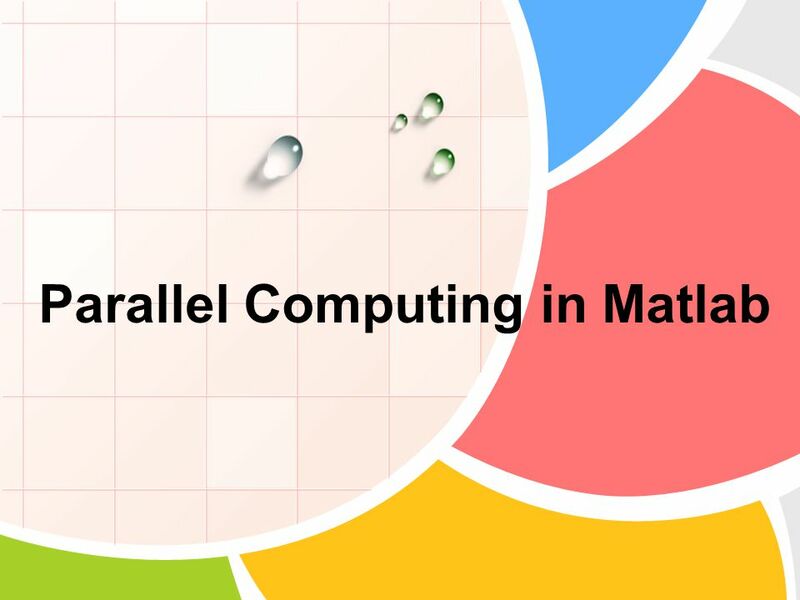 Parallel Computing in Matlab An Introduction. 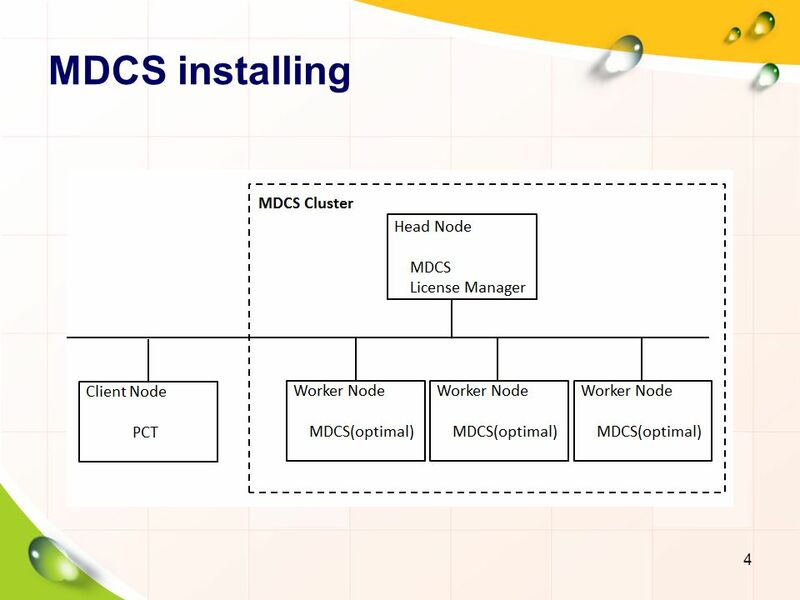 Overview Offload work from client to workers Run as many as eight workers (newest version) Can keep client. Inter Process Communication:  It is an essential aspect of process management. By allowing processes to communicate with each other: 1.We can synchronize. 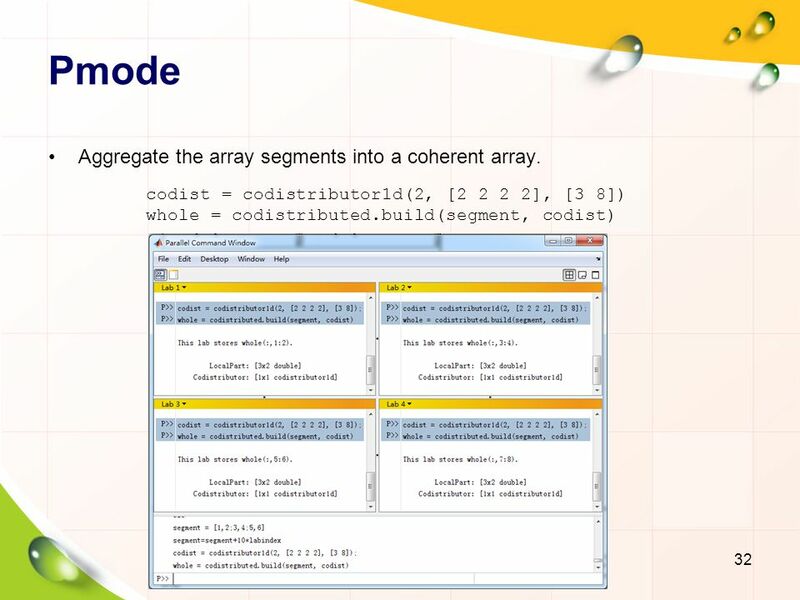 C++ Programming: From Problem Analysis to Program Design, Second Edition Chapter 6: User-Defined Functions I.
Lecture 2 – MapReduce CPE 458 – Parallel Programming, Spring 2009 Except as otherwise noted, the content of this presentation is licensed under the Creative. 1 1 © 2011 The MathWorks, Inc. Accelerating Bit Error Rate Simulation in MATLAB using Graphics Processors James Lebak Brian Fanous Nick Moore High-Performance.